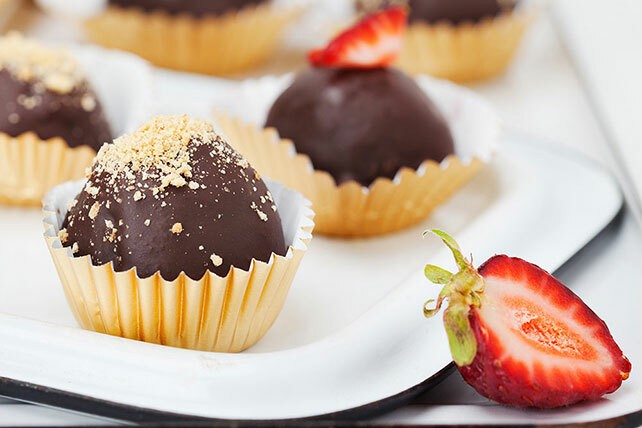 Try Bri Emery’s Strawberry Cheesecake Bites that look like lovely little chocolates from a fancy candy shop. You'll enjoy every creamy, luscious bite! Line 13x9-inch pan with foil, with ends of foil extending over sides. Beat cream cheese, sugar, vanilla and lemon zest with mixer until blended. Add eggs, 1 at a time, mixing on low speed after each just until blended; pour into prepared pan. Bake 1 hour or until center is almost set. Cool completely. Refrigerate 2 hours. Use foil handles to lift cheesecake from pan. Crumble cheesecake into large bowl. Add strawberries; mix well. Shape into 48 balls, using about 1 Tbsp. for each. Roll in graham crumbs until evenly coated. Place on parchment-covered rimmed baking sheet. Refrigerate 1 hour. Melt chocolate as directed on package. Dip cheesecake balls, 1 at a time, in chocolate; return to baking sheet. Sprinkle with any remaining graham crumbs. Refrigerate 1 hour or until chocolate is firm. Cut 4 additional strawberries into wedges. Use to garnish chocolate-dipped balls before sprinkling with any remaining graham crumbs and refrigerating as directed.